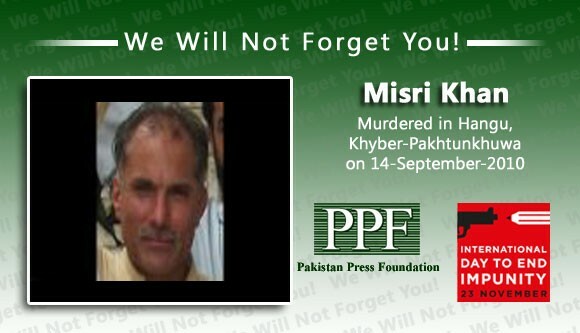 Misri Khan Orakzai, a senior journalist, president of the Hangu Union of Journalist (HUJ) and reporter for a number of newspapers, was shot dead by three unidentified men in the early morning hours of September 14, 2010. The shooting took place in front of the press club in the town of Hangu, in the militancy plagued province of Khyber Pakhtoonkhuwah that borders Afghanistan. According to press reports, Orakzai may have been assassinated for publishing news stories about militants’ activities. He had recently received threats from the militants after reporting on their activities. Orakzai was entering the press club in the morning when three unknown men opened fire on him. The assailants escaped the scene without being challenged by police. Orakzai received one bullet in his heart. He was taken to the District Headquarters Hospital in Hangu where he succumbed to his injuries. A criminal complaint has been registered against the unidentified armed men. Orakzai, 48, had been working as a journalist for about three decades. He was also a social worker in the area and played an active role in highlighting local problems. He reported for “Jinnah” daily newspaper in Islamabad and the daily “Mashriq” in Peshawar. Talking to PPF, his son Umer Farooq, himself a journalist who works as a reporter for the daily “Ausaf”, said his father had been receiving threats for quite some time through telephone calls, and his office had been attacked three times. No one has claimed responsibility for Orakzai’s killing. The Hangu Union of Journalists, the Hangu Press Club and the Tribal Union of Journalists condemned Orakzai’s murder and announced a three-day mourning period. They also set a three-day deadline for the administration to arrest the killers. Meanwhile, the Khyber Union of Journalists (KhUJ) also staged a protest demo at the Peshawar Press Club (PPC) to condemn the killing of Orakzai. Members of the union demanded the arrest of the journalist’s killers and security for others. The demonstration was led by Syed Bukhar Shah, the president of KhUJ, and Shamim Shahid, the president of PPC. The Pakistan Federal Union of Journalists (PFUJ) has also strongly condemned the Orakzai’s killing. In a statement, PFUJ also demanded that the government of Khyber-Pakhtunkhwa province compensate the deceased’s family, which includes his widow, six sons and five daughters. PFUJ noted with deep concern the government’s apathy in protecting the lives and property of journalists, adding that this incident once again makes it clear that the lives of media workers in conflict areas are not safe, and killing media workers has become the order of the day. Saiful Islam Kakakhail, the president of Hangu Press Club, told PPF that members of the press club arranged an emergency meeting at the office of Misri Khan News Agency. Hangu District Police Officer (DPO) Abdur Rashid Khan, who also attended the meeting, said that a police team has been formed to arrest the killers. He assured the journalists that the police force would find the culprits. President Asif Ali Zardari and the Federal Minister for Information and Broadcasting, Qamar Zaman Kaira, have condemned the killing. The President termed it a “heinous and despicable act of terrorism”. Pakistan Press Foundation (PPF) is an independent media research, documentation and training centre working to promote and defend freedom of press.. Follow us on Twitter / Facebook.